Fighters fight, the same way athletes compete in their chosen sport. ONE Interim Flyweight World Champion Geje “Gravity” Eustaquio is different because he does not just compete in combat sports, he lives it. Dedication, passion, discipline, perseverance and humility are the core values he lives by. Values he learned through his long years of involvement in the martial arts. “For me martial arts is a way of life. It’s how you study and grow to become a better person. The unwritten rules in your life that you follow. You fix yourself through the important values like integrity and humility,” said Eustaquio. 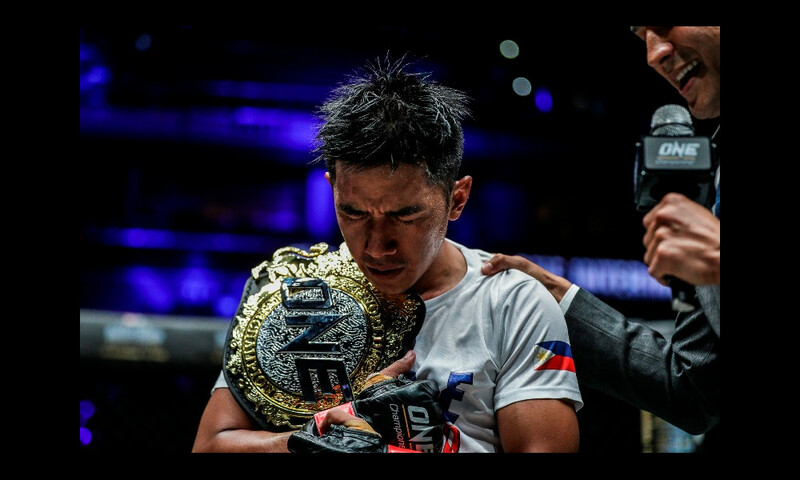 The Filipino MMA veteran battles reigning champion Adriano “Mikinho” Moraes of Brazil in a unification bout for the ONE Flyweight World Championship at ONE: Pinnacle of Power on June 23, 2018 at Studio City Event Center in Macau. Eustaquio will have his hands full against Moraes who is riding a four-fight winning streak. Moraes’ immediate victories include recapturing the ONE Flyweight World Championship last August against Kairat Akhmetov and then successfully defending his title against rising star Danny Kingad last November. Eustaquio is a highly-decorated wushu practitioner. His solid striking has led to huge victories over the course of a seven-year professional career. Eustaquio, a true martial arts practitioner, plans to unveil another facet in his fighter’s arsenal. “I’d like to try my grappling and jiu-jitsu skills in my next fight. It’s part of my growth to become a better fighter. My striking is already there. But I continue to grow as a fighter and as a person,” said Eustaquio. The Team Lakay veteran is brimming with confidence ahead of his bout against Moraes. “I’d say my chances of winning are 70 percent. I’ve trained hard for this fight. My striking is there. But last time we fought my grappling and jiu jitsu were not that good. I’ve improved so much in that aspect which is why I am confident about my chances of winning,” said Eustaquio. Another Filipino in Team Lakay’s Edward Kelly battles former ONE Featherweight World Champion Narantungalag “Tungaa” Jadambaa of Mongolia in one of the supporting bouts. Wushu champion Danny “The King” Kingad returns to action against “The Southern Eagle” Ma Hao Bin who is unbeaten in ONE Championship competition. Meanwhile, reigning ONE Women’s Strawweight World Champion “The Panda” Xiong Jing Nan of China makes the first defense of her world title against Laura “La Gladiadora” Balin of Argentina in the evening’s headlining bout.